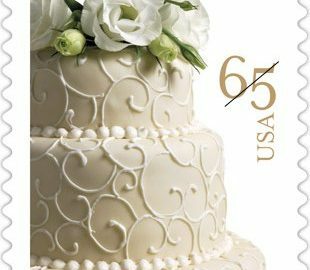 ALEXANDRIA, VA — Brides to be can get ready to mail their wedding invitations now that the Postal Service is issuing a 65-cent Wedding Cake stamp that goes on sale today. The stamp, issued in sheets of 20, is a perfect addition for mailing wedding invitations weighing up to 2 ounces or other First-Class Mail such as oversize cards or small gifts requiring extra postage.“Sure to add a touch of beauty and romance to wedding correspondence, the Wedding Cake stamp, first introduced in 2009, is a timeless addition to the U.S. Postal Service’s Weddings series,” said U.S. Postal Service Stamp Services Manager Stephen Kearney. “Often the centerpiece of a wedding reception, the cake has been a wedding tradition for many generations.” The stamps are available at Post Offices nationwide, online at usps.com and by phone at 800-782-6724.Pastry chef Peter Brett of Washington, DC, created and designed the cake photographed by Renee Comet of Washington, DC, under the art direction of Ethel Kessler of Bethesda, MD. The three-tier wedding cake topped with white flowers and green stems leaves a delightful contrast to the cake’s creamy white frosting. Customers may view the Wedding Cake stamp as well as many of this year’s other stamps on Facebook at facebook.com/USPSStamps, through Twitter @USPSstamps or on the website Beyond the Perf at beyondtheperf.com/2012-preview.